Our customer satisfaction is our top priority. We do our best to maintain an honest, transparent and pleasant client-editor relationship at all times. - consistent and apt in terms of academics, style and tone. Regardless of how good a writer one is, we all need a second pair of eyes to check on missed typos and grammar errors. EssayRight can be your second pair of eyes. 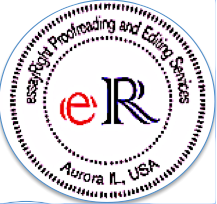 We specialize in proofreading and editing academic and business writing. ​We try to accommodate rush orders to the extent possible. We aim at zero defects. Every one of our submissions go through a minimum of two readings by two different editors before we return the edited document. When necessary we even do a third reading. Apart from internal consistency, this is to maintain quality in editing. How is essayRight different from others? With subject matter, when what you wrote becomes difficult to understand (words/sentences/ paragraphs), we refer to the Internet for information and rewrite them to bring clarity. When sentences are awkward (due to lack of parallelism, mixed construction, or unnecessary passive voice), we rewrite to make them sound smooth, clear and direct. Advising authors on re-organizing the content (sentences/paragraphs), minimize repetition, to improve structure and coherence in their essays.